DAY 5 -- Mason went to bed with a fever last night and woke up at the same temperature this morning. Yes, I realize it looks like we don't feed him, but I assure you he has plenty to eat on a daily basis. No need to make any phone calls. The official word went out today for an event in Indianapolis I've been invited to be a part of. Heartland Film will be hosting a viewing of the Mister Rogers documentary Won't You Be My Neighbor on June 6th -- a few days prior to it's official release later that week. First of all, if you have the means and it's screening in your neighborhood, go see this film. My investment in Mister Rogers aside, you will not be disappointed. Second, I'm humbled to be the "talent" on hand for the Heartland event as I'll be there as an "official" Mister Rogers archivist/historian for a discussion following the film. If you're in the Indianapolis area and are interested in this at all, check out the Heartland site for details. Speaking of Mister Rogers, an advance copy of the upcoming biography The Good Neighbor: The Life and Work of Fred Rogers arrived in my mailbox today. I'm only about fifty pages in and it's, so far, the best Fred Rogers book I've read since Michael Long's Peaceful Neighbor. So very well done from what I've read so far and I'm sure it'll have my full endorsement come September. In the meantime, if you're interested in a solid look at the work of Fred Rogers from an adult (and social issues) perspective, I'd definitely recommend Peaceful Neighbor. My friend from high school, Mike, texted me tonight with a picture that sparked my interest in an immediate road trip. 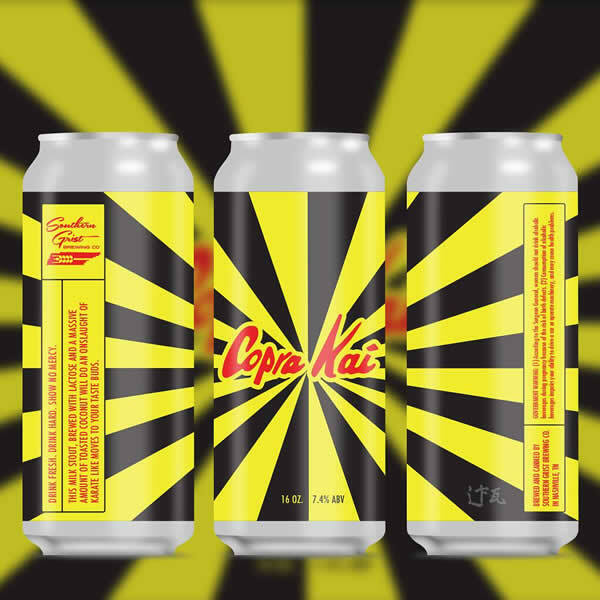 Apparently, Southern Grist -- a brewery out of Nashville, TN -- has created a coconut infused milk stout they're calling "Copra Kai." Reminiscent of the Sweep the Leg peanut butter stout from last year, this Karate Kid fan may stop at nothing to get his hands on a can or two. This evening wrapped up exactly like I'd love to see many of this year's summer nights come to a close -- with some time relaxing in the yard and having fun with the kids. After some basketball and hammock time, the five of us took a bike ride in the church parking lot behind our yard. As we all rode our bikes back to the house, I was reminded of this awesome picture from 1983 taken by my brother. 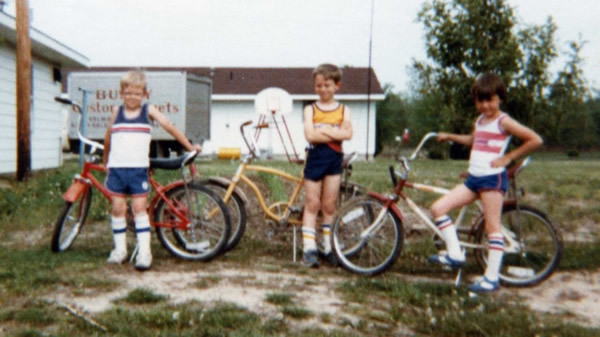 Me and our friends, Greg and Brett -- three tough guys with their rad bikes. Only one thing to do with that kind of memory. Mason's feeling better, by the way.